The gorgeous Catherine of Not Dressed as Lamb HERE has inspired many of us on Instagram with her challenge to wear what had appeared on a list of “24 things you should stop wearing after 30 HERE.” Catherine added a few more items to the list and the challenge continues through August HERE, with the hashtag #iwillwearwhatilike. It’s been fun to participate! One of the items on the list was anything bedazzled, and my inventory is deep in this area, as evidenced by the photo above. I seldom go sleeveless these day, but I was up for the challenge to bare arms (also included on the list) during the sweltering days of August. Never one to pay attention to limiting lists or the pressure to conform based on age, I’m enjoying the life enhancing opportunity to play with others who enjoy “wearing what we love.” I dress for myself and I make my own list. Thank you Catherine, for initiating this brilliant (no pun intended) challenge. Daniel and The SC traveled to the River North area of Denver to Nocturne, a modern jazz and supper club HERE, which is the ideal setting to wear anything that sparkles. We were fortunate to be in the audience on Torch Singer Tuesday for the appearance of Wellington Bullings and the Scott Martin Trio HERE. The Art Deco-inspired interior of Nocturne is magnificent and the dazzling bar provided the perfect backdrop to my shimmering attire. The exterior of the club displays a mural which is representative of the jazz scene inside. The buildings in the alley adjacent to Nocturne are covered with street art and murals, and serve as a breathtaking outdoor gallery space. This area of the city is bursting with creativity and stimulating energy, and motivates me to be more of who I am, which includes ignoring lists that restrict and suppress self-expression at any age. Seguin beret – estate sale, bedazzled dress, black pants and black heeled sandals – consignment stores, jewelry – gifted, estate sales, flea markets. Thank you for your thoughtful comment! You have lifted the spirit of an octogenarian! In life as in the dance, grace glides on blistered feet. I don’t know how but your posts get better and better! And you and Nocturne are a match made in Heaven! Simply stunning!! Love this…I am tempted to just do the same on my next post!!! You look amazing as always. Your Captivating Crones Series is absolutely divine…. This may be my favorite yet. YOU bedazzle us in the most wonderful, inspiring ways! You look stunning and I especially love that picture of you sitting at the bar! Your outfit is a perfect complement to the Art Deco-inspired decor. And Alice is fabulous ! Seriously these young z’tarts have nothing on us! Have an awesome . ..inspired . .week y’all . ..
You are beautifully bedecked and bedazzled. In anything! You have the best figure I have ever seen. Beautiful and chic, my dear friend. Best figure and most certainly my favorite outfit of all time on thee. SPLENDID, SPLENDID, SPLENDID…. Magnificent photos-every one! The one of you inside sitting at the bar is awesome. You look like a model in an ad in Vogue. You just get prettier and prettier…I love this post so much! YOU LOOK SMASHING! My dear, keep being who you are and let’s always wear what we want to wear! We all must be thinking alike because this week, I posted a piece about “At What Age Should We Stop Wearing Certain Clothes? What a gorgeous outfit and photos! So wonderful! The only thing I would be able to add to this is a photo of you emerging from a vintage Rolls onto a red carpet and into a phalanx of eager photographers. But Daniel does just fine – better than fine! Haha. Absolutely. stunning. photos. Right out of another era, but in the here and now. Vital, alive, vibrating with energy. Ah those lists, pitui! You do it right. lovely and fabulous arms and shape. you rock! Thanks for the inspiration. Vavoom! Vavoom! Posts like this make me wish I was still following u w/ a camera! Love u, D.
What a lovely sparkly outfit, Judith! Just divine – you look wonderful. Age is just a number. And thank you for letting us know about the iwillwearwhatilike campaign. I’ll definitely take part as I so believe that as you age there should be no rules – wear what you want, I say! Until I joined Blogland I had no idea there was an age limit on bare arms. Stunning in your wonderfully, glittery outfit Judith . Daniels photos are exceptional this time. I think the #iwillwearwhatilike, is great and just sums up how most of us think. You look absolutely fabulous! If I glanced across the room at Nocturne and saw you sitting at the bar like that, I would think “what a gorgeous woman… and so stylish.” Bring on the bling… bare your arms… and hold your beautiful head up high! I enjoy your posts a great deal, love your independent sense of style. Thought you might enjoy this link to an unusual knitting designer. I could see you in some of these. I love the words on the card that Alice gives to her admirers! You are SMOKIN’ in this outfit and if I didn’t know your age, I would have guessed from these photos that you were in your 50’s. Can I borrow Daniel to take some photos of me for my blog? I especially enjoyed this Beautiful layout. I’m bewitched, bedazzled and bemused that you keep surpassing yourself with your wonderful ensembles. This one sets the bar impossibly high! Can’t wait to be dazzled by your next offering. My goodness, honey, don’t you look swell???!! Must be all the hard work you’ve done in the gym to have such lovely arms. Mine look like they are supporting a week’s washing on the line. It’s not age that’s making me keep ’em covered, it’s pure vanity. That photo of you with the Art Deco backdrop– pure Hollywood! graffiti, black, silver, large earrings — a great morning fix! Oh Judith, what a wonderful outfit, how becoming. You are, what the English say so cute: a sight for sore eyes. I absolutely love this outfit. You will have turned heads. Drop dead gorgeous outfit, and what a wonderful concept: wearing things you should not wear – rules no doubt concocted by the same people who forbade white after Labor Day. Your arms look TONED. Whatever you’re doing to look so good, we should all be doing it! Thanks to your comment on my post over at 1010Park Place, I found your fabulous blog! I love your outfit, that club is fabulous and well…you look fantastic! And also, thank you for introducing me to Not Dressed As Lamb’s wonderful campaign. Ridiculous rules, don’t even get me started. Wow this is such a wonderful look. One of my all-time favorites. Made even more special by the great photography. Of course this place has a special memory for me too as I think back so fondly about our evening spent at this beautiful club. I’m sure you will spend many more evenings there! I used to avoid sleeveless garments and then I thought – what the hell – and I’ve been wearing them since. Who wrote these rules, who decided that women should be hidebound as they get older. What should we be wearing a burka? You and the women you feature on your blog are an inspiration, sleeves or not are up to us. I agree –no sleeves please! You look absolutely stunning, Judith – like a Golden Age Hollywood movie star in the Art Deco bar. Beautiful! Is that a movie set you’re on? And you’re the star!! Is it a musical? Jazz/ blues perhaps? I didn’t know you sang too. Or perhaps you play an instrument…keyboards? bass? what say you? You’re a fabulous example of someone who dresses in what makes her feel good – and that shows by just how incredible you look. Your sparkles in this outfit are STUNNING. 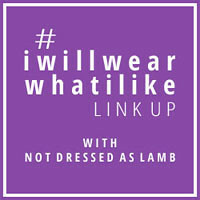 I’m so glad that you’ve been enjoying #iwillwearwhatilike – I have plans to continue it some way after the end of the month so keep an eye out for what I have planned…! Judith, this is a wonderful post. You look sensational, regardless of age, and why not show those lithe and toned arms. I wrote a post this summer called “These arms” and had lovely feedback from girlfriends. You must have dazzled everyone at the Jazz club.